يقع في دونكيلد, Southern Grampians Cottages إنه المكان الأنسب لاكتشاف غرامبيانز و ما يحيطها. لا يبعد الفندق كثيراً عن مركز المدينة، فهو يقع على بعد 1.2 km منها. في حين يستغرق الطريق منها إلى المطار حوالي 25 دقيقة. يوفر الفندق بفضل موقعة الجيد وصولاً سهلاً إلى أهم معالم المدينة.
. يقدم Southern Grampians Cottages خدمات لا غبار عليها وكل أشكال اللياقة وحسن الضيافة اللازمة لإسعاد ضيوفه. يقدم الفندق فرصة للاستمتاع بشريحة واسعة من الخدمات بما فيها: واي فاي مجاني في جميع الغرف, تخزين الأمتعة, واي فاي في المناطق العامة, صف السيارات, خدمة غسيل الملابس . لقد جهزت هذه الإقامة الفندقية بعناية فائقة لتوفر مستوى عالي من الراحة. في بعض الغرف يجد النزيل تلفزيون بشاشة مسطحة, اتصال لاسلكي بشبكة الإنترنت (مجاني), حوض الاسترخاء, غرف لغير المدخنين, مكيف هواء. يمكنك الاستمتاع بالأجواء المريحة التي تقدمها حديقة طوال النهار. إن Southern Grampians Cottages هو خيارك لخدمة الفنادق الراقية في غرامبيانز. يُرجى ملاحظة أن الأطفال المقيمين مع النزلاء ستُفرض عليهم رسوم إضافية. ويجب دفع هذه الرسوم لمكتب الاستقبال مباشرةً عند الوصول. Perfect place to stay in Dunkelm. Lots of wildlife around and very comfortable. At the southern tip of the Grampians a real, modern, stand-alone 2-bedroom cottage. Very comfortable. Easy walk to all the places to see in Dunkeld. Saw a kangaroo just chilling in the cottages and that was a truly mind blowing experience. The place was quiet and peaceful, a really great place away from the cities. The staff was really friendly and even gave us places that are opened till late without us asking and that really helped a lot. It was a really good stay! Attentive but not intrusive hosts, very cosy, comfortable and clean. Feeling of privacy in a bush setting. Walking distance to town and short drive to Grampians walks in the area. 2m drive from foot of Mt Sturgeon, 10m walk/2m drive from centre of town, and a short drive to Halls Gap. Accomodation is clean, quiet and spacious with lots of amenities. The couple that run the property are lovely and very helpful. When we come back we will stay here. George is a wonderful host, even when we arrived late he was happy to provide us with a breakfast basket. Do try the eggs. They are so fresh and good. We even bought a couple dozen to bring home. The cottage is self contained with very good quality utensils and towels, which I did not expect in a country cottage. The garden is immaculately maintained and the log fire kept us warm in the victorian spring that never makes up its mind. There are air conditioners in the cabins as well so warm days would be nice too. If you are there for a hike in the grampians, there are two mountains and a hill to hike very closeby (southern grampian walks). It does take a ~45 minute drive to halls gap for some other walks so have that in mind. Dunkeld itself is a beautiful quiet town with a very nice bakery. There are several short day trips to surrounding towns that you could do if you wanted such as Hamilton. The only thing I'd comment is the shower is quite small. It has everything you would need. Excellent. Great cabins and everything was excellent. A warm welcome from George, quick check in, lovely cabin in a wonderful garden. Beautiful Grampians in the backyard, wildlife around you. Wonderful, clean cabin with good beds, bathroom and kitchen, lovely decorated. Great talk with Caroline at check out. Lovely people. One of my favourite places during our six week Australia-trip. Fully equipped cottage with special attention to details, feels like home away from home. Owners George and Carolyn were friendly, helpful and patient with our queries before, during and after our trip. We booked this cottage for ours weekend getaway. Definitely is a good choice. 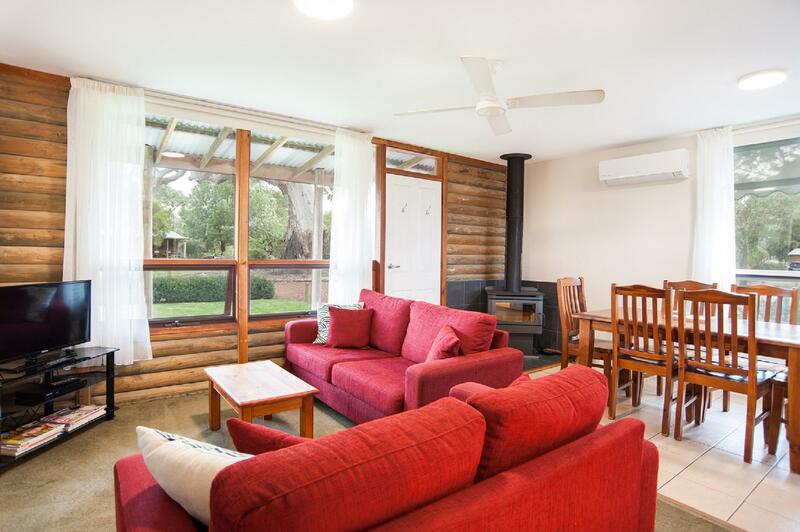 Cottage is superb, clean, spacious, nice view overlooking Grampians and has everything you need. The spa is a plus, and the fire place is so romantic. Highly recommended it. The room and the whole area were well maintained and clean. We enjoyed all the room facilities and the view from the cottage. Highly recommended. A lovely place to stay for a cosy winter getaway. Great fire and good facilities. 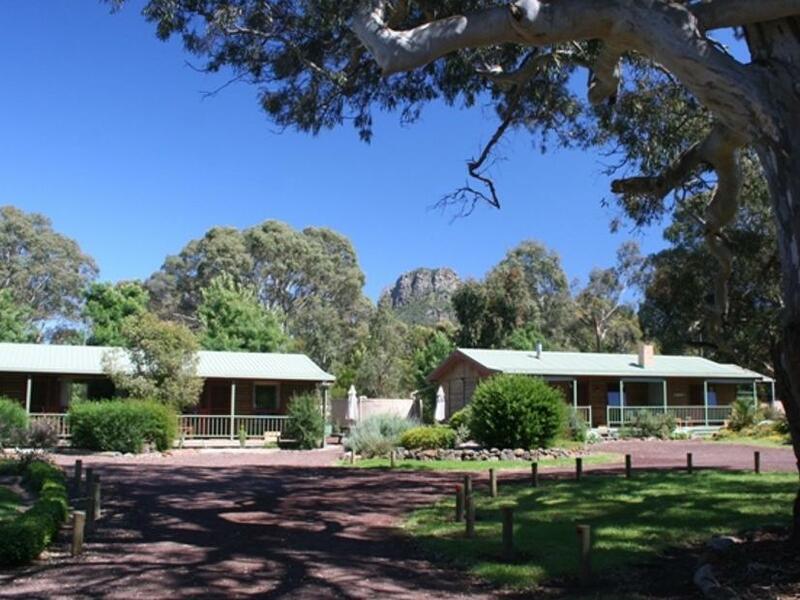 Excellent proximity to the town and Grampians. Cottage is equiped with absolutely everything you need. It was clean and staff were very helpful. Cottage is huge for a couple, easily stay 4-6. Location is a short walk to the little town. If u are having dinner at Royal Mail you might need to drive though, specially if cold and dark. Loved the spa bath and fireplace. Used the dvd player, candles, kitchen utensils... will come back here for sure. Many thanks, it was perfect!!! Friendly, Clean and well maintained. Wow what a gem! So cheap and such a great little cottage. At dusk go to the local school (the owners will show you where that is, it's not far) and check out the kangaroos. clean, cosy place to stay. loved it and will recommend to all heading to grampians.